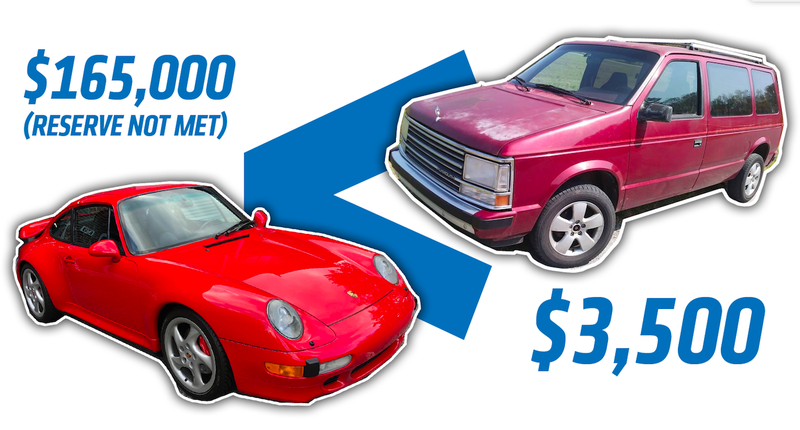 Why Buy This 33k-Mile Porsche 911 for Over $165,000 When You Can Get a 254k-Mile Turbo Plymouth Voyager for $3,500? I just don’t get it. Somehow we live in a world where non car-enthusiasts keep buying SUVs with no off-road capability, and car enthusiasts keep spending ridiculous sums on Porsche 911s. All this when really, they should all be buying this five-speed 1990 Plymouth Voyager Turbo for much, much less. What am I not getting here? Radwood Philadelphia was this past weekend, and the attendance was definitive proof that ’80s and ’90s cars are “in.” That’s great news for the seller of this 33,000 mile 1997 Porsche 911 Turbo for auction on Bring a Trailer. Bidding climbed all the way to $165,000 before ending with the reserve not having been met. I couldn’t help but spot this 1990 Plymouth Voyager Turbo with a five-speed manual transmission, and it’s for sale on Craigslist for a measly $3,500. That’s $161,500 less than the Porsche’s final bid, which—as you may recall from a few paragraphs before—wasn’t even enough to buy the car. Put another way, you can buy over 47 of these Plymouth Voyagers for the not-quite-enough $165,000 bid for that 993 Porsche 911. Under the hood, there’s a 150 horsepower turbocharged 2.5-liter four-cylinder mated to a five-speed manual. That made this minivan hot stuff back in the day. Sure, the Porsche makes 400 horsepower, and it sends those ponies to the correct set of wheels, but what use is all that power when you can only transport two humans? The Voyager will move eight while smoking those front tires (on a wet day), plus, its imperfect paint will make it much more useable than the Porsche. Seriously, do you want to be this guy checking paint thickness? Or do you want to be wringing out the turbo four-banger in a high mileage, rough-around-the-edges, boxy K-car-derived minivan without a care in the world? The answer is, as always: Buy the damn minivan.